Last year I saw this recipe in one of my books or one of my magazines that I own. It got stuck in my head ...well..for a year, so now that is blood orange season I decided to look for it and try it. The problem was that I couldn't remember from which magazine or book came from. I looked in all my pastry books and nothing...so I went to look for my magazines and...after days of looking for it, I got it. This is a fantastic recipe. The flavor is just out of this world. The mix of flavors, the color, the texture...it just works. So, here it is....enjoy while blood oranges are in season! With an electric mixer beat butter and brown sugar on high until you get a light and fluffy mix, about 3 minutes. Lower the speed of the mixer to the minimum and add the salt, the rosemary and the flour until the dough gets together -it will look too soft, don’t worry!- Do not over mix. Gather the dough , form a flattened disk and wrap with plastic film and chill for at least 1 hour. Remove the dough from the fridge and roll it out on a lightly floured surface. Extend it until you get the desired diameter (if the dough is too hard, don’t worry, just let it out for periods of 15 minutes and try to work it again…it should be a bit hard, but not brittle). Transfer to the tart pan, making sure that the edges are fully extended up sides. Bake for about 10 minutes and remove from oven. Allow it to cool down on a cooling rack. Add butter, lime and orange juices, sugar and zests into a saucepan and melt butter over low heat. Reserve. Beat the eggs and combine with the egg yolks. Beat until incorporated, then pour into another medium saucepan. Add the salt. Slowly whisk in 1/4 cup of the warm butter mixture to temper. Now, slowly whisk egg mixture into the butter mixture and stir over low heat until starts to thicken (be patient!.low heat is a must!! )…about 10 minutes. Do not stop stirring and do not boil or bring up the temperature or you will ruin the filling! 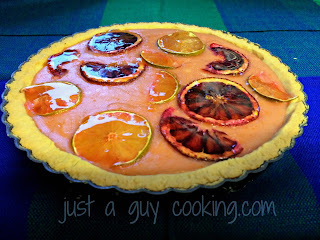 Now, let’s decorate with the lime and blood orange thin slices and bake for approx. 10 minutes. Remove from oven and reserve. In a small saucepan mix the brown sugar, the corn syrup and the water over medium heat. Now we have the “shine” we want for our fruit slices. Brush them carefully and allow it to cool at least 2 hours before serving. I like it cool so I put it in the fridge for another hour or so. I know I have been busy...way busier than I anticipated for the beginning of 2016, but I really wanted to share this fantastic recipe with you. On my looooooong trip to Mexico in December, my head recipe researcher -and provider-...my mother in law, had a ton of small newspaper and magazine clippings that she collects for me so I can read them and decide which ones to try. This was a tinny clipping for a Christmas wine catalogue and I loved the idea of mixing my Molecular Gastronomy list of proven recipes with the satisfaction of eating plantain, which I find irresistible. Plantain is a very common comfort food in Mexico and Centro America and if any, I recall eating them on top of Mexican rice since I was a kid until...well, my last trip. The sweetness of the plantain and its extraordinary texture has no equal. The only thing is that it takes time to prepare (and sadly most places prepare them with tons of fat which makes the unappealing). The opportunity came soon enough for me to try this recipe as my current wife's friends... the ones who include couple of art lovers, crazy architects and some just extraordinarily nice people I know, were to have a post Christmas gathering and the wife offered to bring an appetizer. The request was done using the proper channels -the "by the way" method- and... just because I had this recipe in mind... I went for it. The dish was a success!, no doubt, with some people asking if the center were gummy bears (really???? ), wine gums, uncooked something, blood...name it. That is, until they tasted them. Big big success!. O personally loved them. The problems: first I should have had my own serving dishes as I used the salad ones (sorry Val) and... they were not enough. They just went. They were consumed around the kitchen island where most of the gathering happened... I wish they had waited for the proper presentation, but hey... not always things happen as planned. At the end the satisfaction came out of the reaction of the wife's friends. The rest is history. 1 Large Plantain (whole, including peel) semi-ripe (not green but not black dotted), about 325 g.
4. Dissolve the Sodium Alginate into a bowl with 2 cups of filtered water and blend with a hand blender. The Sodium Alginate is a bit goopy so make sure you get it all off the sides of the blender. Don’t leave any residues. The mix will look clear -a bit whitish-. Allow it to set for about 1/2 hour (by then all the bubbles and foam are gone). 5. Take the mould out of the freezer and pop the frozen “wine spheres” into the Sodium Alginate bath. Notice that if they haven’t frozen solid, put them back into the freezer because they’ll just goop up the bath. 6. Put a couple of spheres in the bath and leave for 3 minutes. The Calcium Lactate that’s suspended in the frozen liquid starts to melt and reacts with the Sodium Alginate in the bath but because it’s flexible, the casing becomes spherical and cures, trapping the wine inside of it. 7. Stir gently to keep the spheres separate with the perforated spoon and after 3 minutes put them in a bowl of water to rinse. 8. Using your perforated spoon, move the wine spheres into a special small bowl that contains some of the same wine, to keep them moist. We’ll use them from there, when needed. 1. Plantains have a variety of names that depend on geographical culture. for example “plantago”, “plátano macho”, etc. We wan to to buy 1 plantain that is ripe but not soft nor black. 2. Slice off the edges of the plantains and cut them lengthwise. Do NOT peel the plantains! 3. Put the 2 sliced plantains in a medium saucepan with approximate 2 cups of water. What we need is that the water covers the plantains and have about 1/2” of water over them. Bring it to a hard boil and then reduce the heat to simmer for about 1 1/2 hours until they become a bit soft but not more than that. 4. Drain the plantains, peel them and mash them (I do it with a fork) until they get a pulp consistency - a bit dry pulp though-. 5. Mix the mashed plantain with the sugar and the butter and with your hands wet (otherwise the mix will stick to your hands…) and make 6 golf size balls. 6. Using your finger make an indentation into each ball and place a wine sphere in the center of it and close it carefully with the same plantain mix. 6. Roll each ball on the bread crumb mix and reserve. 7. Using a small frying pan, medium heat, fry the plantain balls until golden (they will be crispy) and place them on a paper towel to absorb the leftover oil. Reserve. Using your blender, mix the whipping cream, the lychees and the anise liqueur, until you get a soft but not runny cream. Put it in the fridge to cool a bit . On top of the lychee blob, place the plantain sphere and on top of the plantain sphere pour s small tea spoon of the lychee cream and then place the cheese cracker on top. 3. On a side drop another tablespoon of the lychee cream and carefully create a line using a knife. * The image is not mine as I served this dish elsewhere with no time for fancy pictures. The recipe is a modification on Master Chef Josefina Lopez, from the Chapulin Restaurant, Mexico City.